Tonja Gunvaldsen-Klaassen was born on the Saskatchewan prairies in 1968, growing up between her hometown farm and Calgary, Alberta. Klaassen returned to Saskatoon to attend the University of Saskatchewan where she graduated with a Bachelor of Arts Degree with a concentration in Literature. Klaassen’s prairie upbringing is reflected in her first book of poetry Clay Birds (Couteau Books, 1996). After marrying, she moved to Halifax, Nova Scotia where her next two books, Ör (Brick Books, 2003) and Lean-to (Gaspereau Press Ltd., 2009) were written. Each of Klaassen’s three books explore themes of family relationships but the form of her poems become more experimental with each book. Klaassen’s poems demand a reconsideration of approaches to common, essential human experiences in order to discover meaning within the unknown. Klaassen’s poetry has been recognized by many award nominations and successes: Clay Birds was shortlisted for the Gerald Lampert Award and won the 1996 Saskatchewan Poetry Award; Ör was shortlisted for the Pat Lowther Award and won the 2004 John V. Hicks Manuscript Prize; Lean-to won the 2010 Atlantic Canadian Poetry Prize. Tonja Gunvaldsen-Klaassen continues to write poetry in Halifax, where she lives with her husband and three sons. Published in Ӧr. (Brick Books, 2003). Critical Analysis: Defamiliarization: leading to new understanding in "Gravity"
Tonja Gunvaldsen-Klaassen explores the concept of defamiliarization in much of her poetry. Defamiliarization is a concept defined by the Oxford English Dictionary as “the process or result of rendering unfamiliar… in which formal devices may be held to revitalize the perception of words” (OED online). Literary theorist Viktor Shklovsky defines defamiliarization as a process where a “novel point of view…can make a reader perceive in an unfamiliar way” but so that “the unfamiliar is as easily digestible as possible” (18). The poem “Gravity,” from Klaassen’s 2004 poetry collection Ӧr, introduces the image of a bear which, by defamiliarization, gives a new appreciation to its presence. “Gravity”’s unfamiliarity occurs in the first line “O omniscient, omnivorous, oneiric bear” when readers realize that the poem is about a bear and not, as the title suggests, about gravity (1). Describing the bear as “relating to dreams” creates ambivalence towards the creature’s significance (OED). Yet, by using the image of a bear to describe gravity, Klaassen leads readers to trust the abstract concept of gravity so that they can “easily digest” and learn from it. Elements of the familiar nursery rhyme Star of Wonder, introduced in lines three and four, accomplish the learning process begun in the first line: “Bear of Wonder, Bear of Night/First bear I see tonight: a sigh” (3-4). These lines offer comfort for the bear, who earlier, was nothing more than a mythical creature dwelling in the realm of uncertainty. The bear’s identification with a nursery rhyme gains familiar favor in readers, but its significance still needs to be considered, which Klaassen reveals in the final half of the poem. In line seven, we learn that the speaker is “Agoraphobic,” meaning afraid of the “open air” (7, OED). The bear’s physical location in the poem is in the wide open “cosmos,” meaning the bear represents exactly the openness and vulnerability of the unknown that terrifies an agoraphobic (7). The bear’s frightening presence continues when it is described as an “eater of roots and dreams and gravel,” “gravel” being a physical representation for gravity (12). This is an example of literal defamiliarization because the bear destabilizes the narrator, throwing them into what they fear most: the unknown (12). Despite this uncertainty, the narrator begins to “digest” the bear, lessening the narrator’s fear of the creature, bringing its purpose closer to understanding (Shklovsky). Familiarity is found in the Star of Wonder nursery rhyme, the narrator finds it through the play on words of “bare-hands,” as they realize that the bear has human characteristics (11). In a revelation sprung from familiarity, the narrator admits to the bear that you “dug your way into me;” not only is the bear a part of the narrator, but it has shaped them into who they are, refining them through lessons of defamiliarization (13). The unknown prevails in Klaassen’s poem, but comforts readers with an appreciation for the previously unknown meaning of the bear. “Gravity”’s defamiliarization of the bear “revitalizes” the perception of the word “bear,” exemplifying how, without entering the realm of the unknown, the opportunity to learn is impossible, just as is the chance for personal growth (12, 1). Klaassen, Tonja Gunvaldsen . Ӧr. London: Brick Books, 2003. Print. Shklovsky, Viktor. Art as Technique. 1917. Pdf File. 22 Sept. 2014. Klaassen, Tonja Gunvaldsen. “Clay Birds.” Breathing Fire: Canada’s New Poets. Eds. Croizier, Lorna, and Patrick Lane. Madeira Park: Harbour Publishing, 1995. Print. ---. August: An Anniverary Suite. Kentville: Gapereau Press Ltd., 2005. Print. ---. Clay Birds. Regina: Couteau Books, 1996. Print. ---. “12 or 20 questions: with Tonja Gunvaldsen Klaassen.” Rob McLennan’s Blog. Blogspot, 2009. Web. 9 Sept. 2014. ---. Lean-to. Kentville: Gaspereau Press Ltd., 2009. Print. --- . Ӧr. London: Brick Books, 2003. Print. Anonymous. “Clay birds.” Books in Canada. 11 (1996): 6-8. ProQuest. Web. 9 Sept. 2014. Anonymous. “Loop, Or, Fielder's Choice.” Books in Canada. 32 (2003): 41-42. ProQuest. Web. 9 Sept. 2014. Borkent, Mike. “Love, Familiar and Fracticious.” Candian Literature. 206 (2010): 151 – 52. Print. Brandt, Di. "The Unspeakableness of Love." Canadian Literature. 155 (1998): 184-87. ProQuest. Web. 9 Sept. 2014. Broadfoot, L. “Spring fiction: Old hands, new voices.” Quill & Quire. 62.1 (1996): 13-14. ProQuest. Web. 9 Sept. 2014. Carpenter, David. The Literary History of Saskatchewan – Volume 2: Progressions. Regina: Couteau Books, 2014. Print. Leochnigg, Maria. “[Or] [Karenina Sings the Blues] [At the Mercy Seat].” Journal of Canadian Poetry. 20 (2006): 105 – 15. ProQuest. Web. 9 Sept. 2014. Schoemperlen, Diane. “Vital Signs: New Women Writers in Canada.” Ottawa: Oberon Press, 1997. Print. 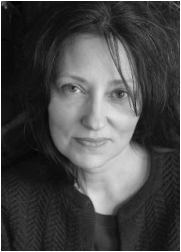 “Tonja Gunvaldsen-Klaassen: Biography.” Writer’s Federation of Nova Scotia. 2012. Web. 10 Oct. 2014.